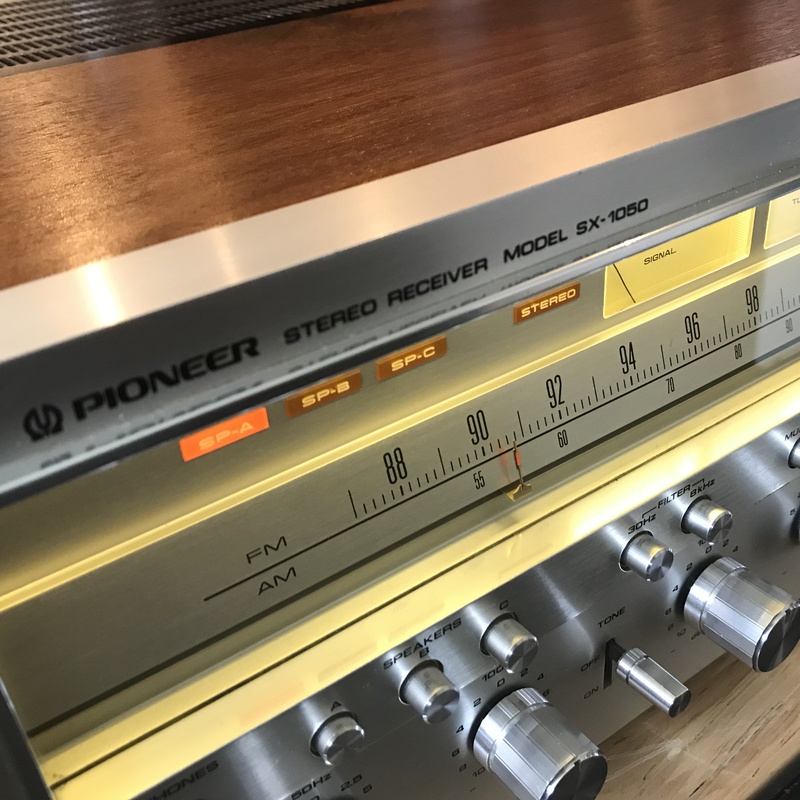 Of all the vintage solid-state receivers in the world, I think the Pioneer SX-1050 is my favorite and probably the only one I’d want to own for myself. 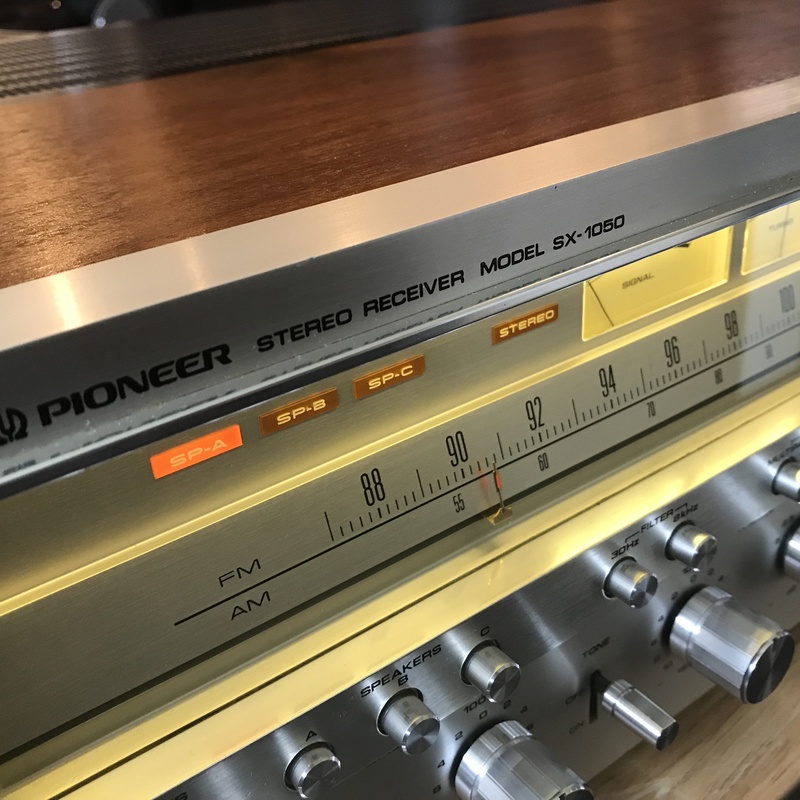 Pioneer units from this era, to me, are the best built, best sounding, best looking, and the best to work on. 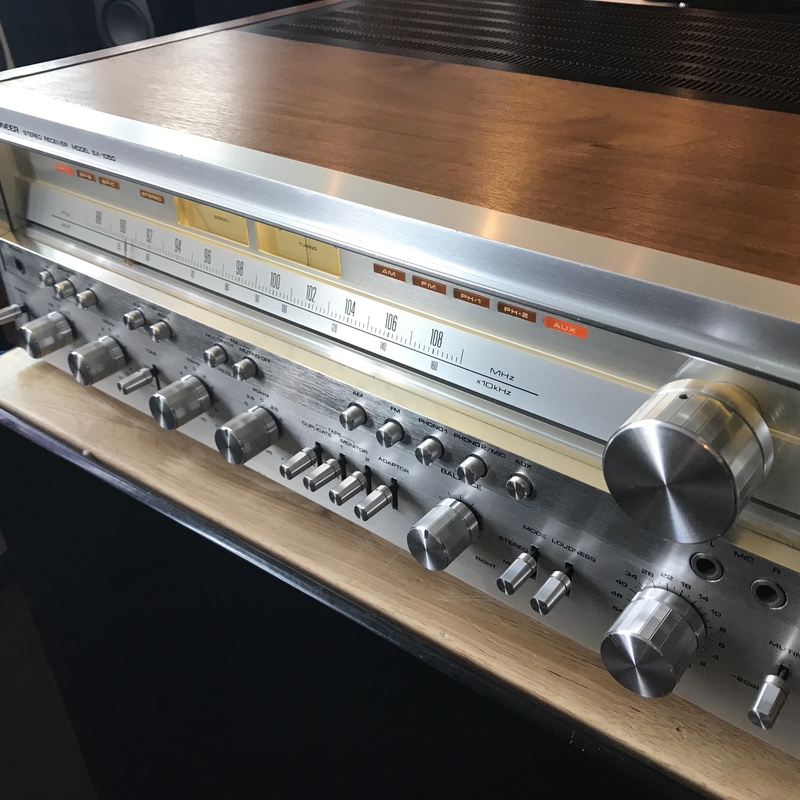 Compared to other big name stereo receivers of the time… Marantz, Sansui, Sony, Yamaha, Kenwood, Luxman, Technics, and maybe even McIntosh. Pioneer was doing it right. Their best units were the SX-_50 models, rather than the cost-cutting SX-_80 series after it. The SX-1250 was the TOTL model at the time, but I think the SX-1050 was better. 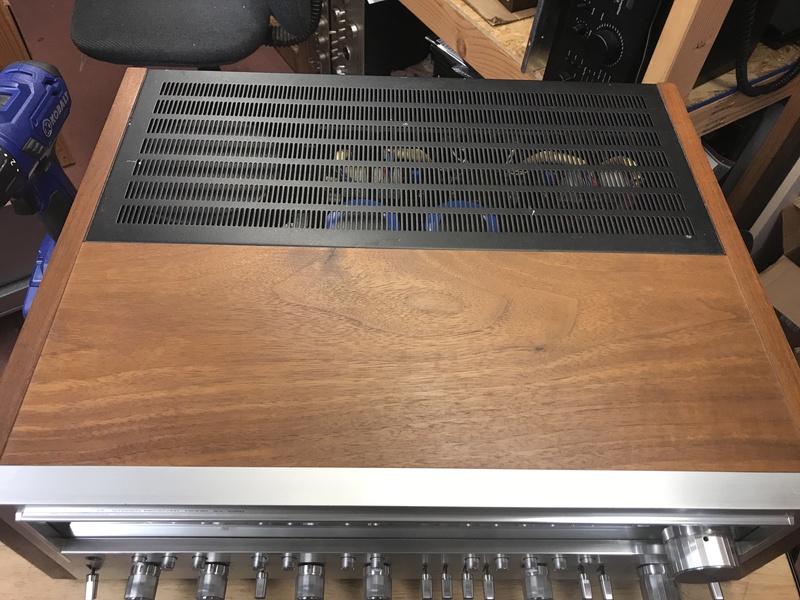 Compared to the 1250, the 1050 still had more than enough power and better looking (with the full wood case and more sensible size). We do countless SX-_50 units, and this one came out great. 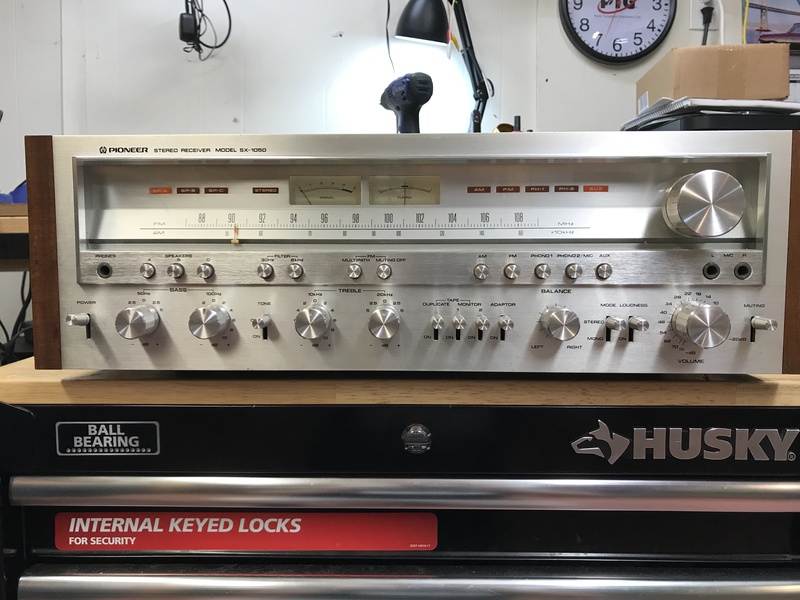 The unit was fully functional when it came to us, so this will be a pretty straight forward restoration, even if its still got a lot of components to swap. 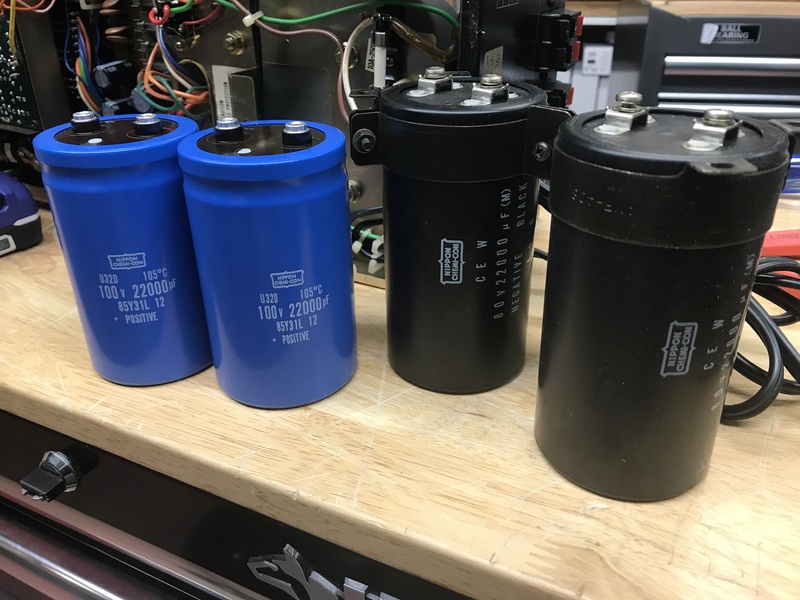 We have all the normal parts on hand for these 50 series units, except for the large filter caps. While those are ordered and being shipped, the rest of the power supply and protection circuit will be rebuilt. 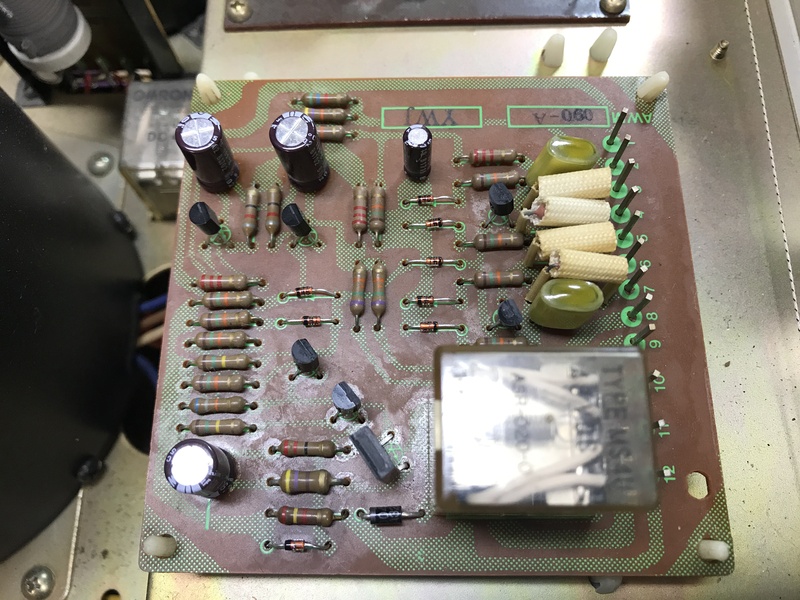 There are three main boards that need to be addressed: Power Supply Assembly A, B, and the Protection Board. One is easy, one is a bit more involved, and one is truly annoying. The slideshow to the right shows each board and a short description of what gets changed. This Power Supply Assembly “B” board is simple, once you free it from its standoff mounts and dig it out of there. 3 big caps! These units can develop brittle standoff clips, so you may need to order some because they shatter often. This unit was fine however! 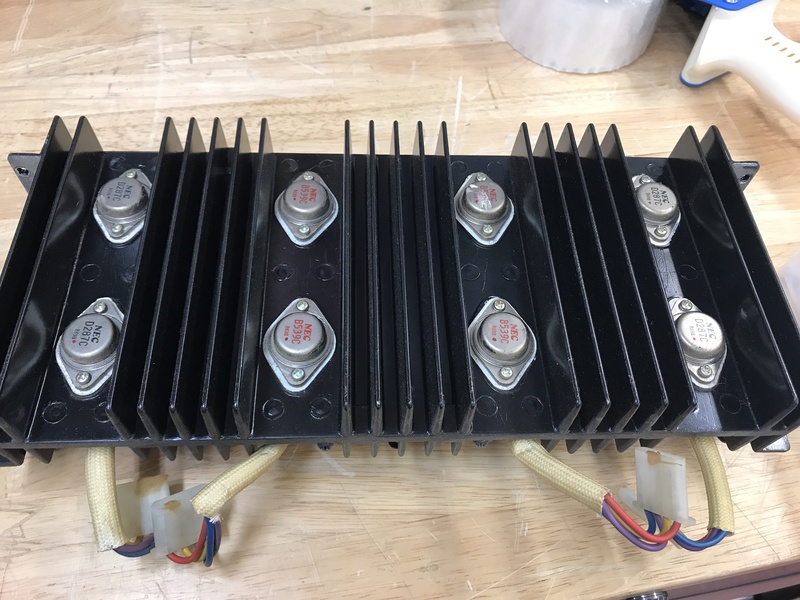 Nichicon high temperature/high reliability caps are what we use for any non-signal path capacitor. They are reliable and durable. VZ and PW series are what works best, depending on availability. The old caps had an un-used 3-leg for stability on the board, the new caps are only standard two leg caps, but they work perfectly. This is the original protection board. 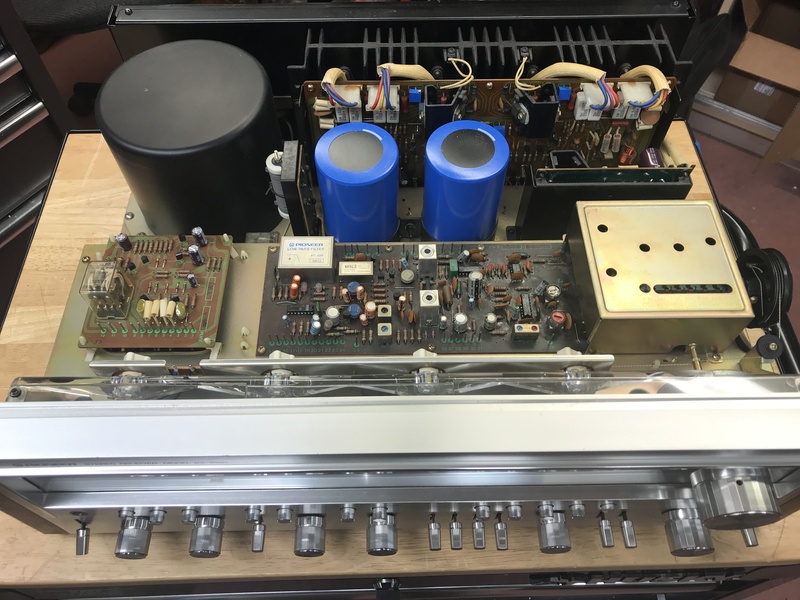 Unlike Marantz 2270, the relays on these 50 series Pioneers have never failed on us before. 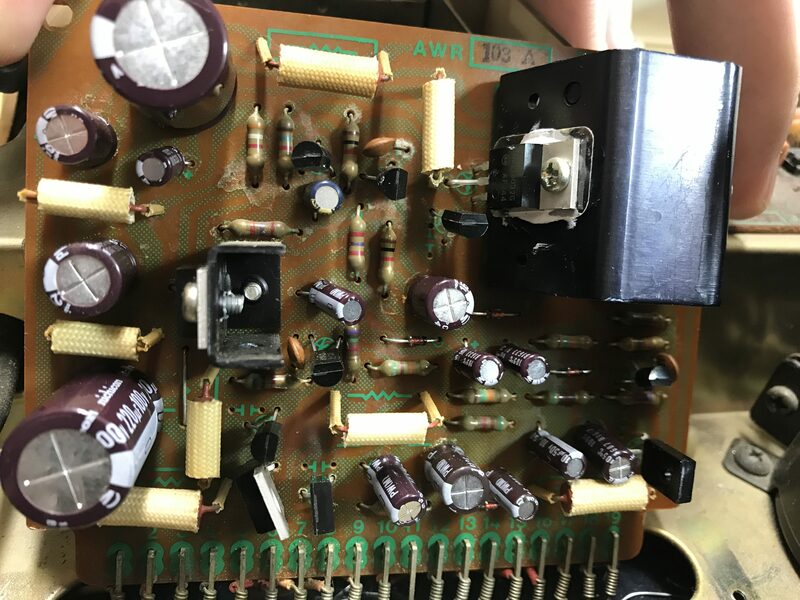 This board has a lot of diodes and transistors that will be replaced along with the electrolytics to keep the relay functioning correctly. The older relay drive transistors are run hard, so we will replace them even if they’re still working. 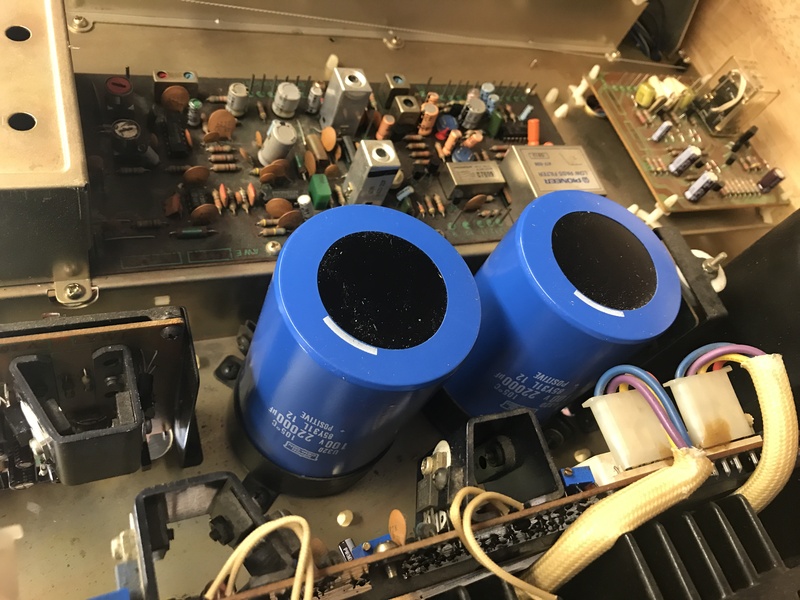 All electrolytics are replaced with PW series Nichicons, and the .22uf ‘lytics change to the yellow Panasonic film caps. 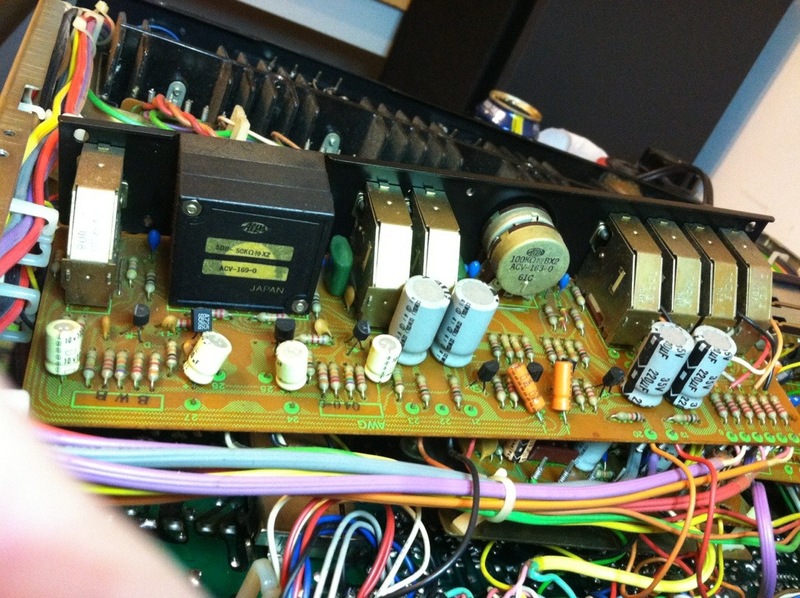 The transistors are all replaced, some being replaced with much heavier duty replacements. Q6 and Q7 benefit the most from being replaced, as they are the relay drive. The diodes are also replaced (1N4148), and D9 is upgraded to a heavier duty 1N4004. The D5 zener is changed to a new 1N5257B. 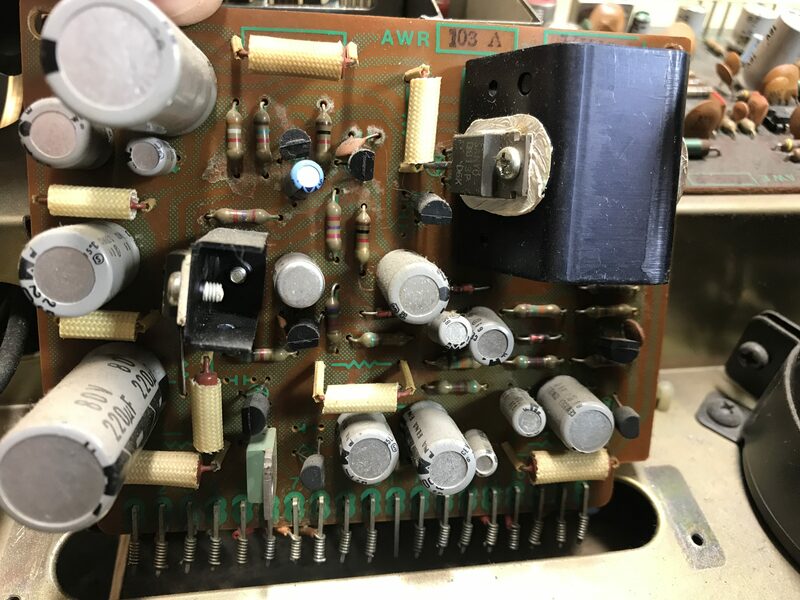 This Power Supply Assembly “A” board is the worst part of the restoration. 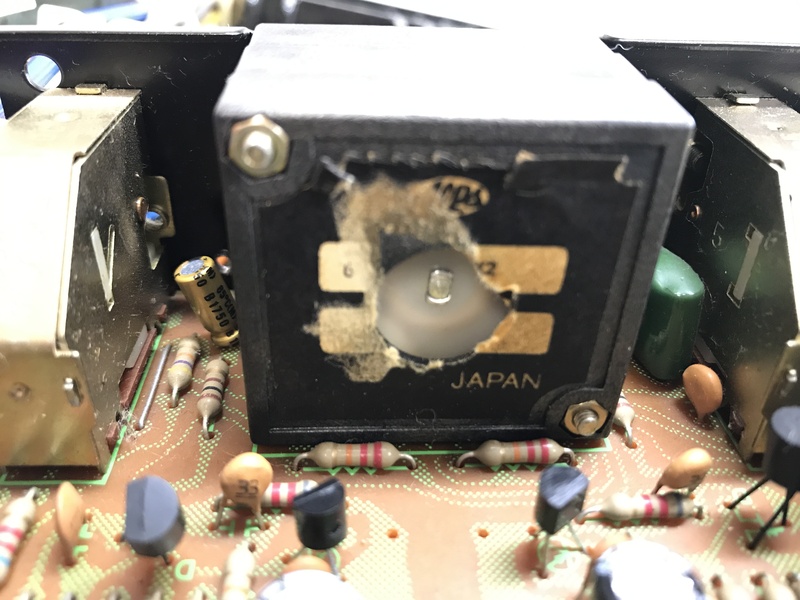 There are a whole bunch of capacitors, transistors, and diodes that need to be replaced but worst is that it is hard to get open access too. 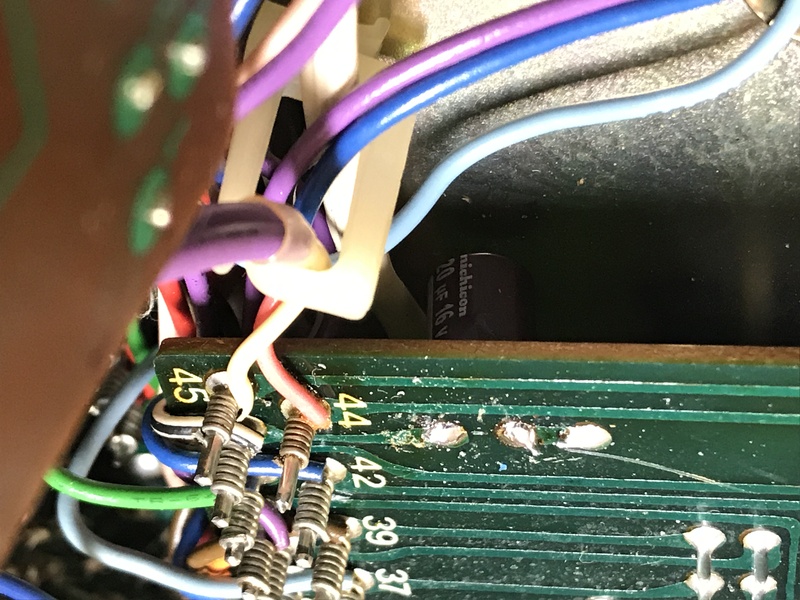 It helps to remove the amplifier heatsink, tilt the amp board away, and remove the FM tuning cap cover to free up some access. All the transistors are replaced with modern equivalents, and the regulators are replaced with new thermal paste applied. 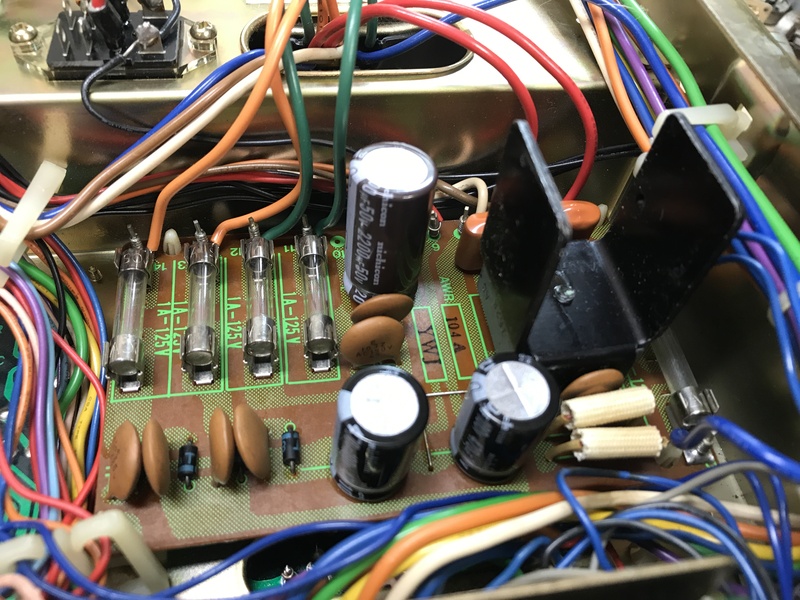 The 6v, 13v, and 14v zener diodes are replaced as well. 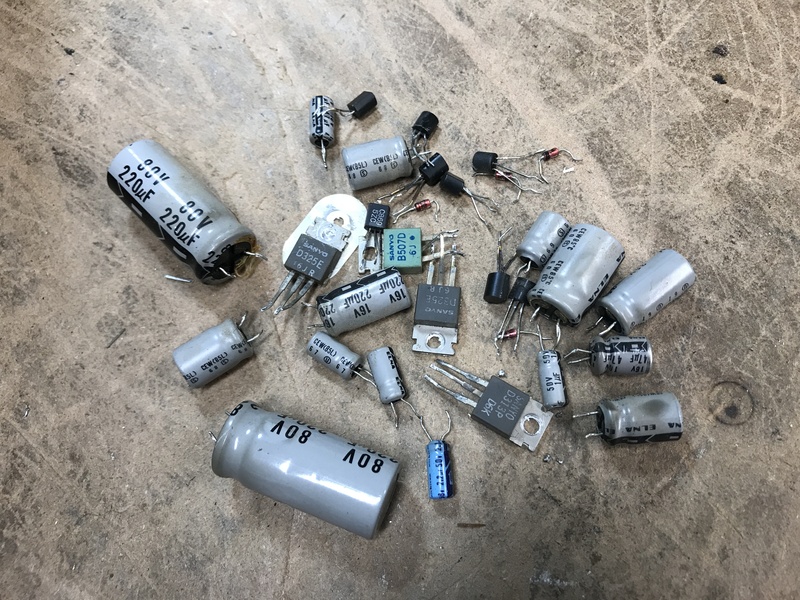 All of the capacitors are replaced with Nichicon PW series caps. 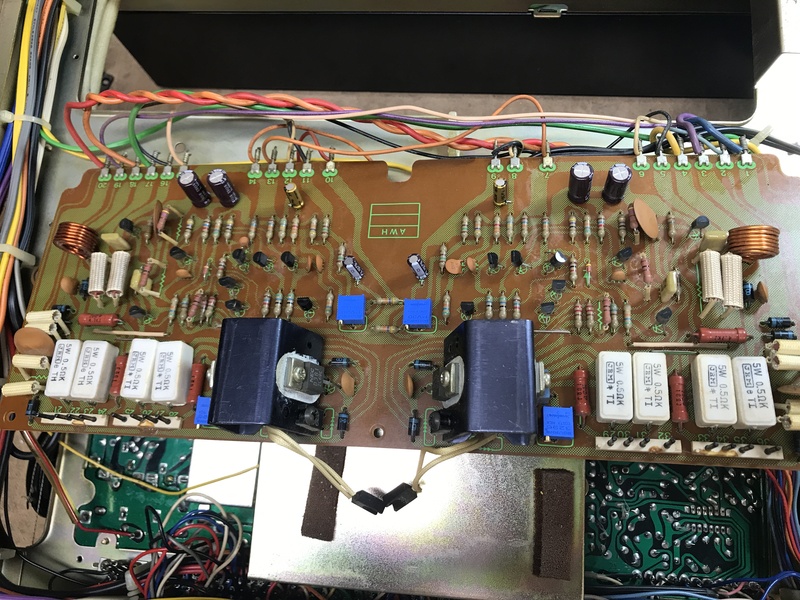 There is a lot of components that get changed on this board… This board gets hot due to the regulators. 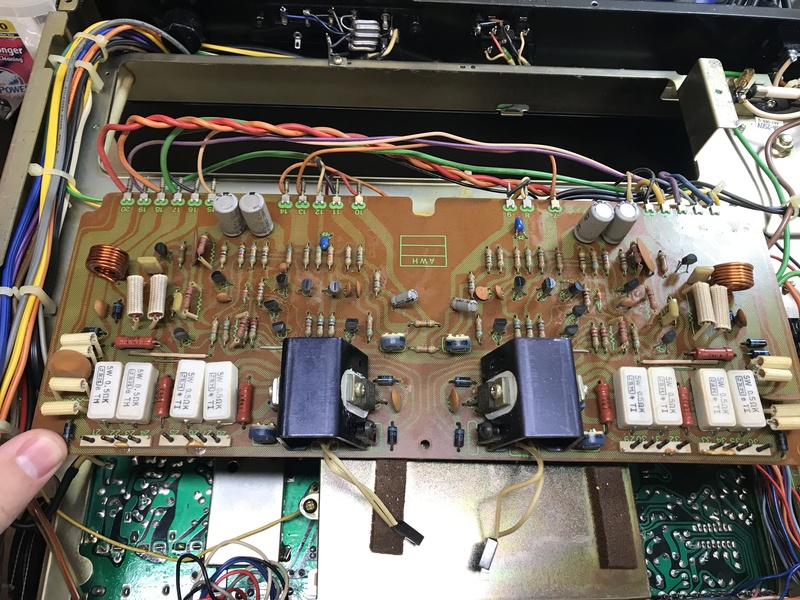 Even when the unit runs a while at normal listening levels, the heat you feel from the top of the unit is probably from this board rather than the amp board. No concern, a little heat is normal. This is the phono stage. It is on the underside of the unit, with a metal case to shield it. 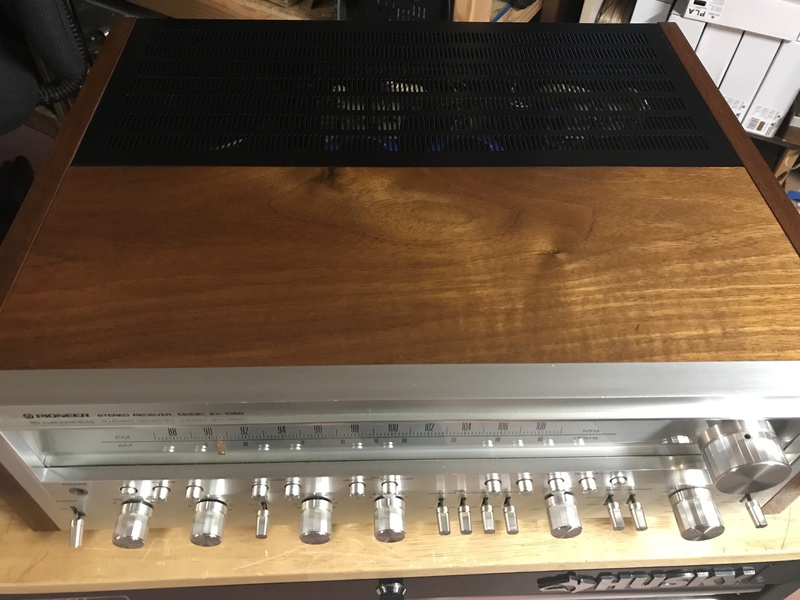 The MM phono preamp in this unit is much more substantial than 95% of built-in phono preamps of other receivers from this era. 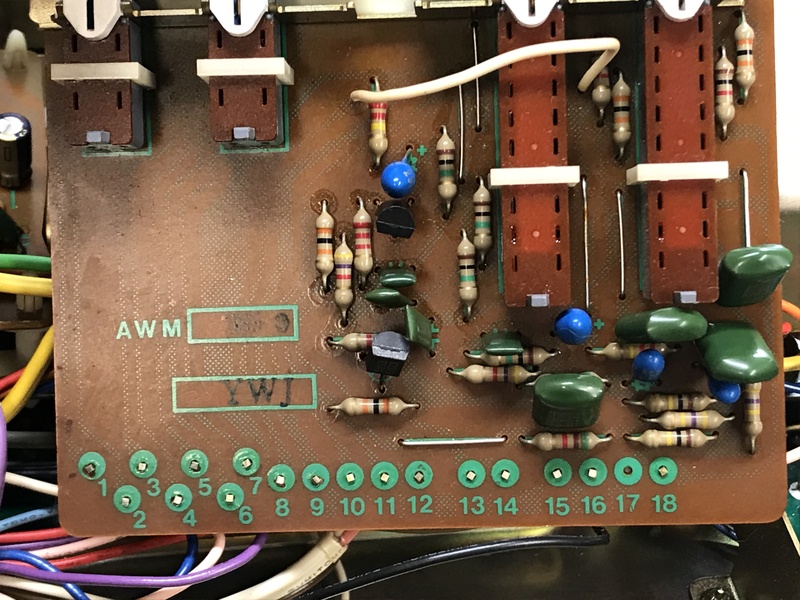 The transistors with the orange dots were originally gain matched. They are also 2SA726 transistors in some units, which are known to be noisy and prone to failure. We swap in KSA992 that are gain matched as well. 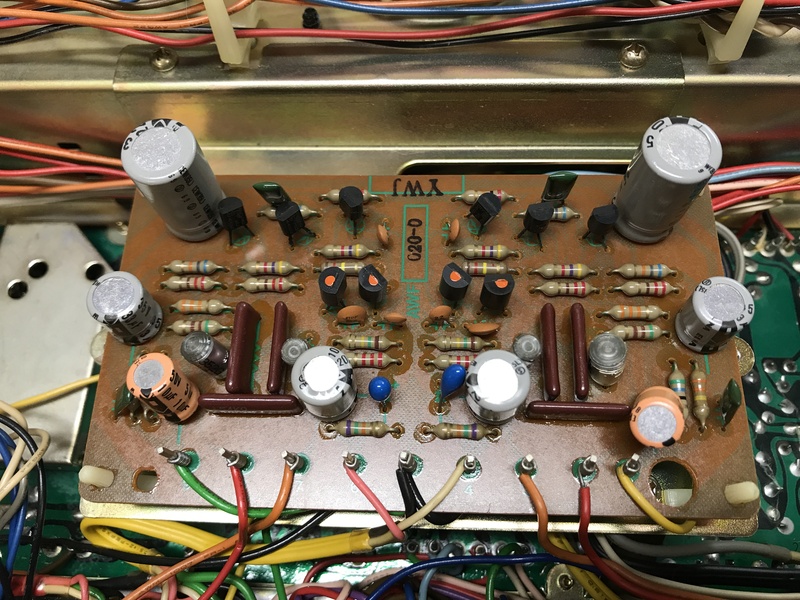 The other transistors are also replaced, but gain matching isn’t necessary. KSA992 or KSC1845 replace the other 2SA872/2SC1775. The blue tantalum caps and the orange low noise are replaced with Nichicon Fine Gold low-noise audio caps. The other gray electrolytics are filtering, so more Nichicon PW caps will replace them. 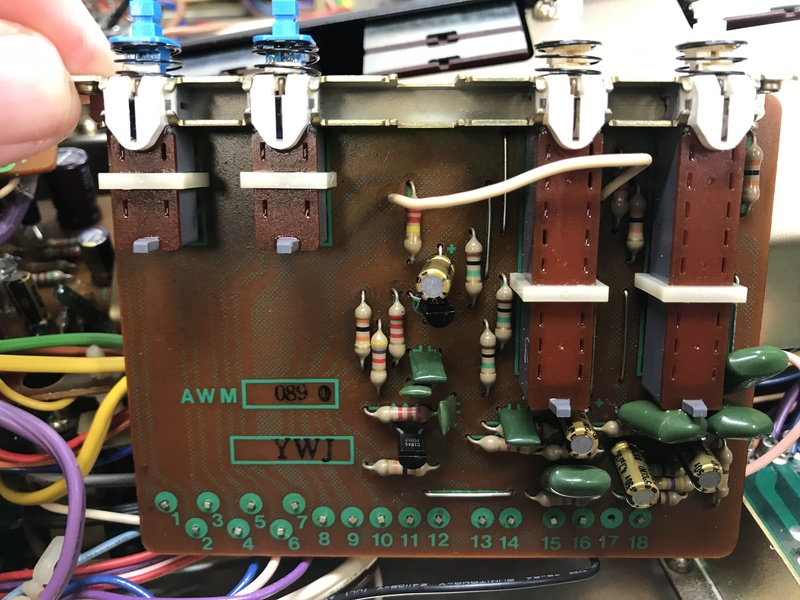 This board has enough mobility that it is easy enough to work on, however be careful with this era of Pioneer… The wire-wrapped, square-posts connections from board to board on this unit are an ideal connection, however the wires become brittle over the decades. As you work, and pivot boards back and forward to get to each side, make sure none of them snap! Next is the “Control Amp” tone control board. I forgot to take a picture before I began this board… I was in the zone. It is covered by a metal case to shield the circuit.The board is almost a mirror image, so I did half, and then took one picture for comparison. While there are a lot of components on this board, it is relatively easy. All of the electrolytics are low noise, with a few tantalums. Nichicon Fine Gold caps go in for the smaller 2.2uf capacitance caps and the tantalums. The larger 100uf caps are Nichicon KL series. The 2SC1312 transistors are also known to be noisy and prone to failure, like the 2SC726. They are replaced with KSC1845. The board is tedious and time consuming, but easy. After the Control board, we move to the Flat Amp board. 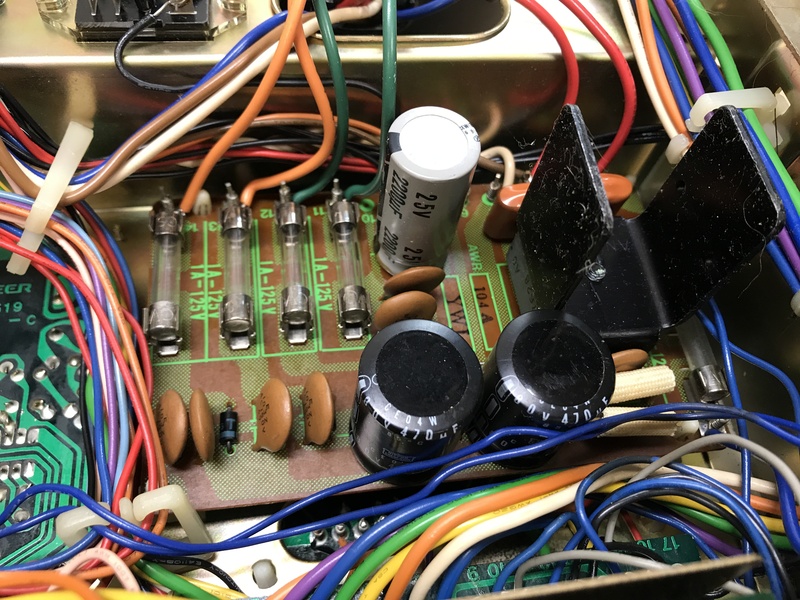 There are some tantalum caps hidden up near the controls. a bit of a pain to get to by the volume control. The 2.2uf are replaced with Nichicon Fine Gold and the 1uf are changed to WIMA film caps. The yellow and orange electrolytics are changed to new Nichicon low noise caps, KL or Fine Gold caps depending on values. The larger 220uf caps are not in the signal path, and are replaced with PW caps. 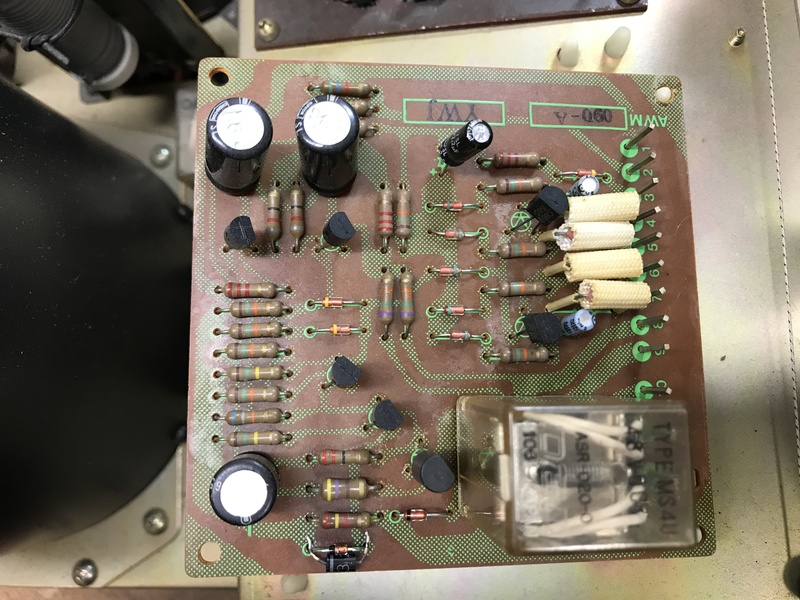 The transistors are all swapped with modern equivalents. There are two FETs on this board, so be careful to leave those alone. At some point in the past, someone cut open the sticker on the back of the volume pot to clean it. I always thought these were completely sealed controls… Good to know! There are a few other little details in the push-button boards to make sure to address as well. This is the filter assembly board. Fine Gold Low noise caps replace the tantalums, and notoriously noisy 2SC1313 are replaced with KSC1845. The function switch assembly has one 220uf cap. It is difficult to get the board out. 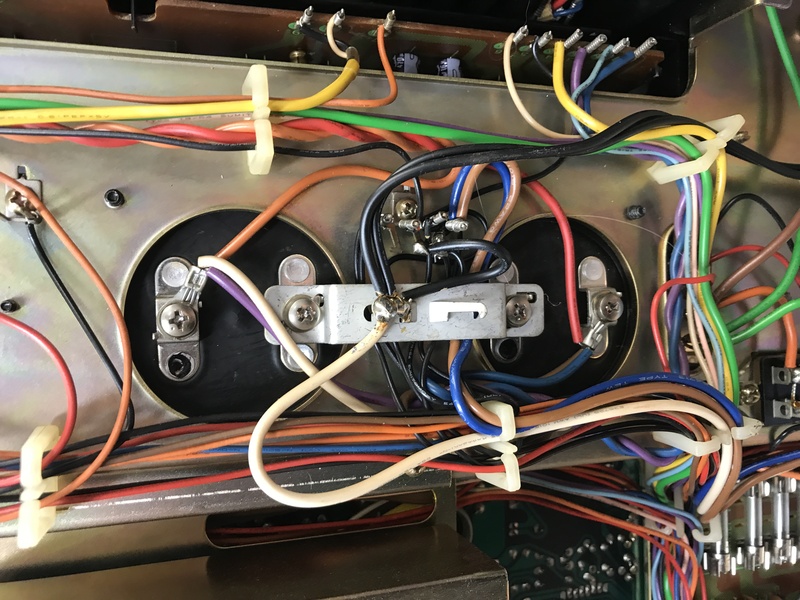 The buttons and wiring can be fragile. I maneuver the cap in from the side, paying attention to the correct pos/neg orientation. Easy to miss this little guy. The heatsink easily comes completely out of the unit. This makes working on the power amp section MUCH easier. Actually, it is probably impossible without doing so. Anyways, while it is out of the unit, it benefits the amp to remove the old thermal paste (and dust that has stuck to it) from the output transistors and put new paste on. It is easy, quick, and will help the amp shed heat. 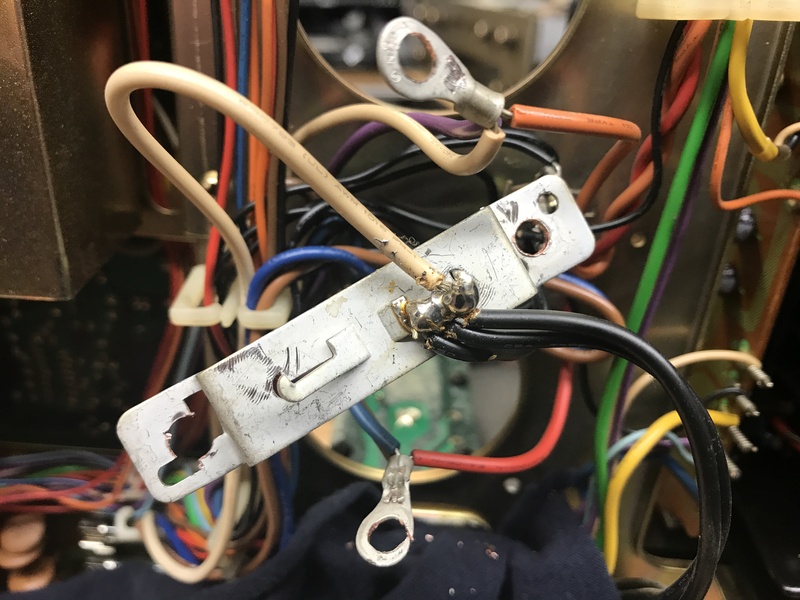 Be careful you put the transistors back correctly! The amp board is next. 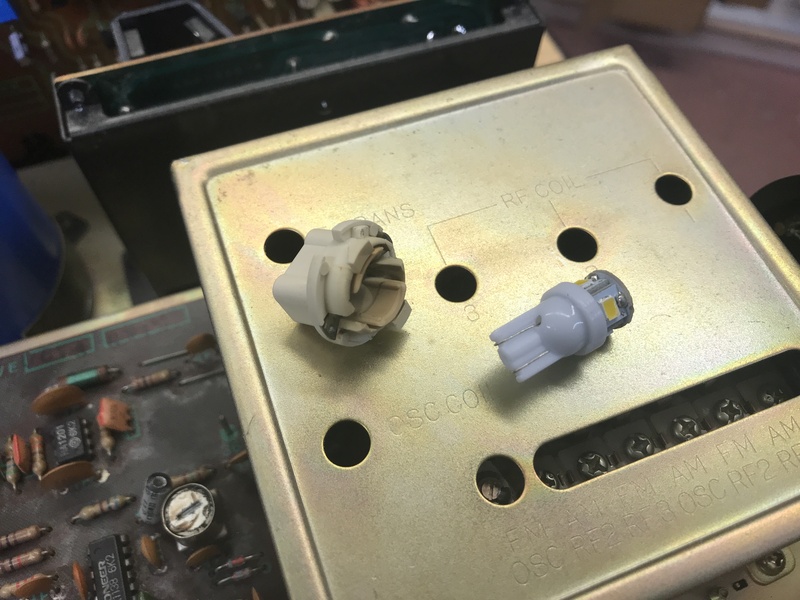 With the heatsink removed, it can be pulled out through the bottom of the receiver, leaving it wide open to work on it. Just be careful to not put too much stress on the wires. 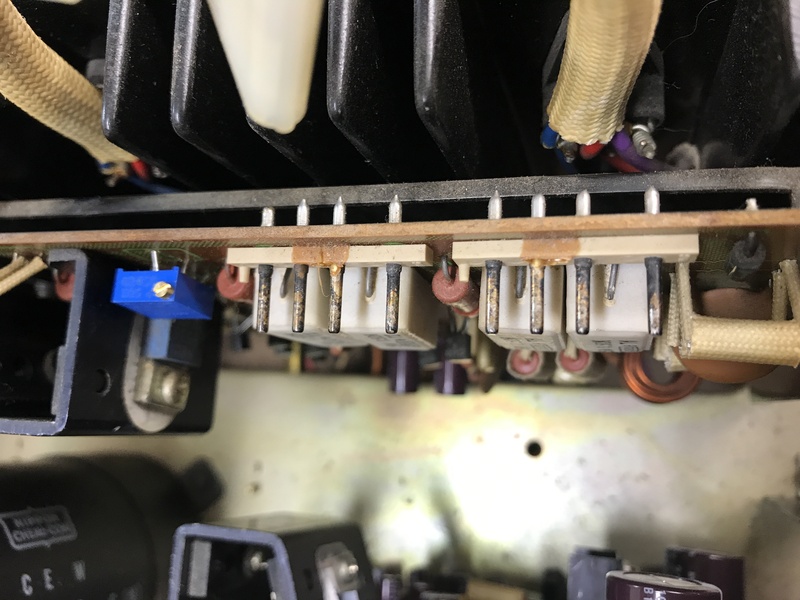 Also be careful not to break the diode packs that are mounted to the heatsinks. Those are hard to replace. The usual with capacitors on this board. The tantalums are replaced with low noise caps, and the grey filtering caps with PW series caps. The transistors on this board can mostly stay. If you swap too many with new ones you can get oscillation issues due to higher gain. 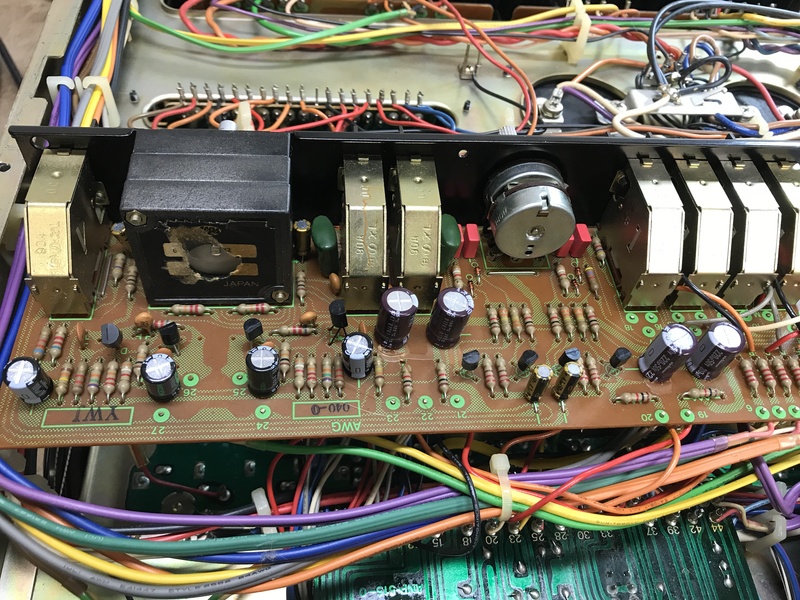 Typically, in a unit that was working fine before the restoration, we only change Q1-Q6… the 2SA750s. 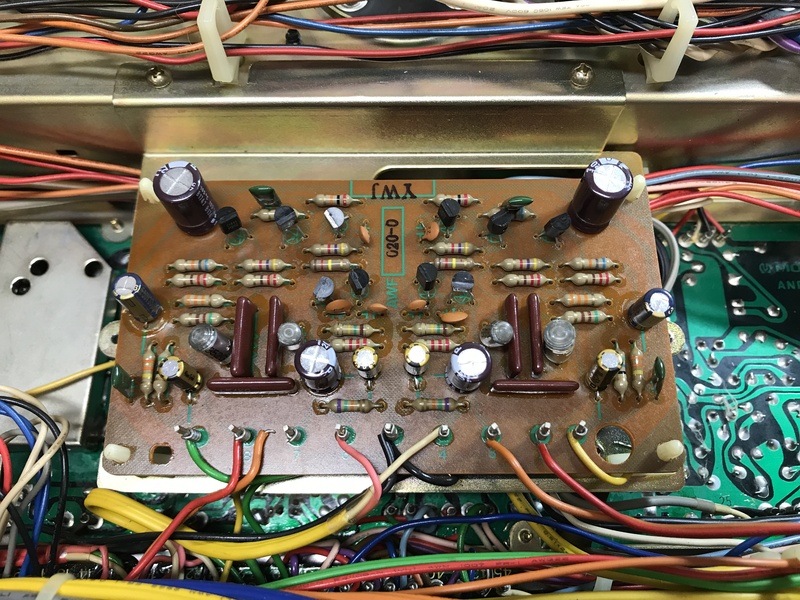 Q1-Q4 are the input differential pairs, and we change those on just about every solid state receiver we restore. Q5 and Q6 follow the input pairs. 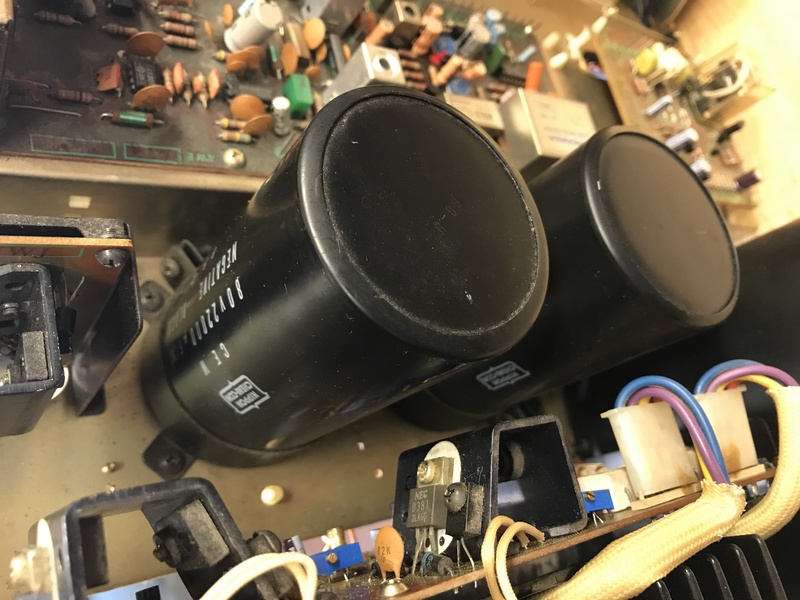 The old bias and DC offset pots in these often perform poorly. They were cheap parts (hard to dial in) and accumulate dust and dirt (can throw off measurements and performance, need cleaning). We put in high quality, 26-turn Bourns potentiometers. The originals were 1 turn, but 26 turn pots allow you to dial in bias and especially DC offset easier. 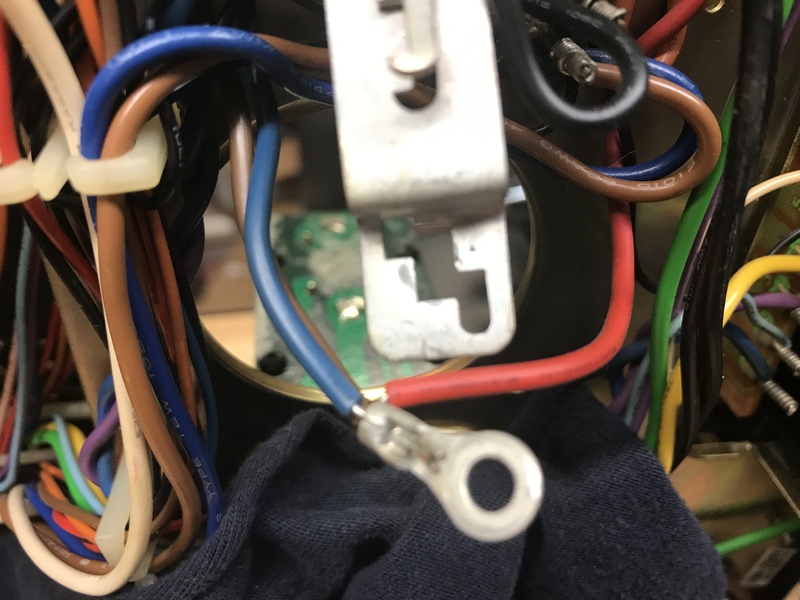 Due to heat, dust, etc., the wiring harness pins from the amp to the outputs acquire a lot of grime and oxidation. This unit had it bad. DeOxit D100 and a little brushing cleans them up fast to their original, clean shine! The original filter caps are 22,000uf 80v, with screw terminals. These are easy to change, but will probably require some modification to the mounts underneath. 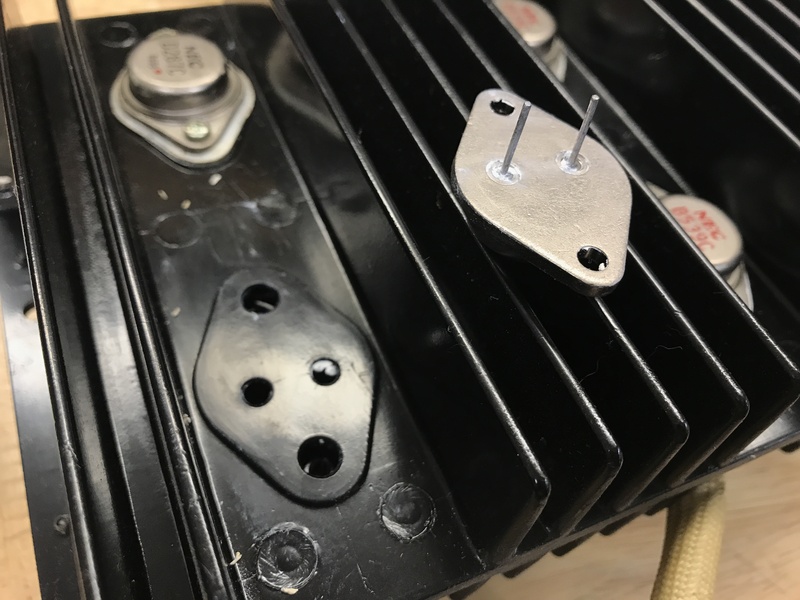 The new caps we order are 22,000uf 100v, but they are the same diameter so they fit in the same clamps as the original. They are slightly shorter, which is not a problem. The old hardware vs the new. The new hardware on the filter caps is considerably larger. 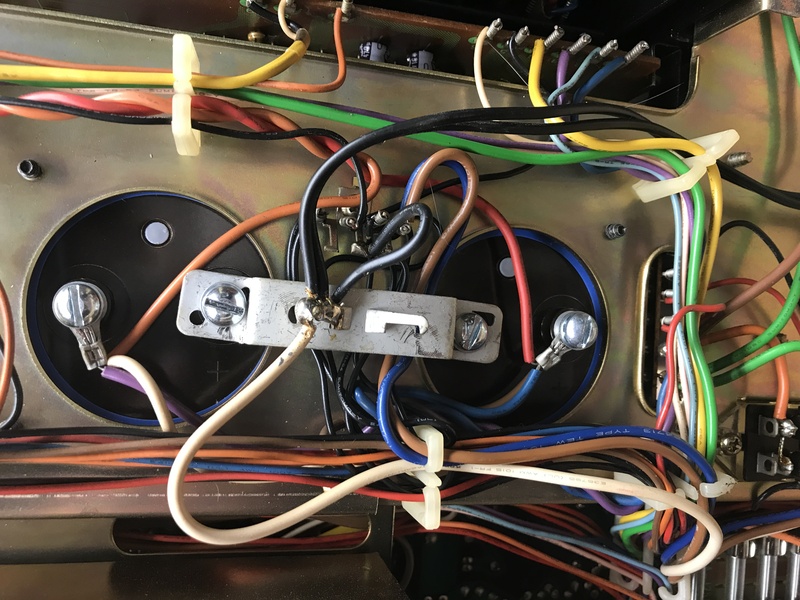 Original connections… They need slight modification. 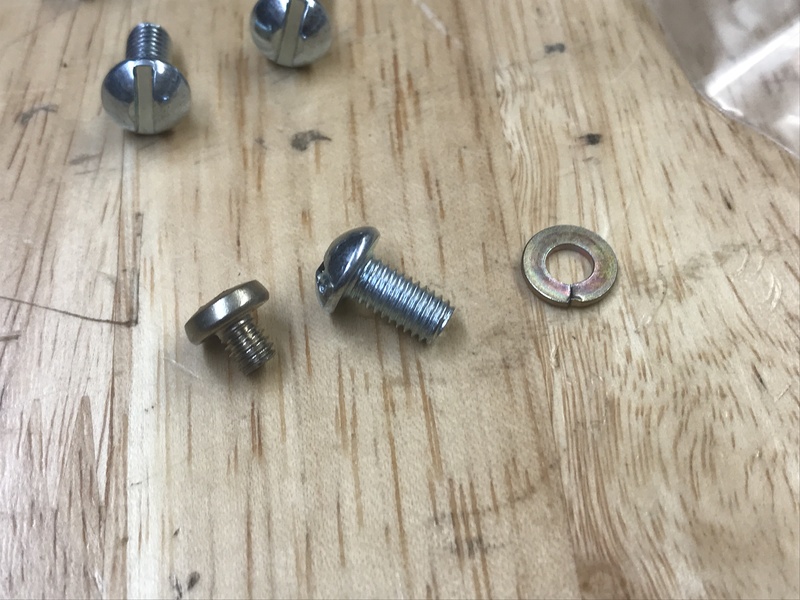 These need to be bored out a bit to fit the new screws. After, they mount right in. The new caps have the same lead spacing as the original. 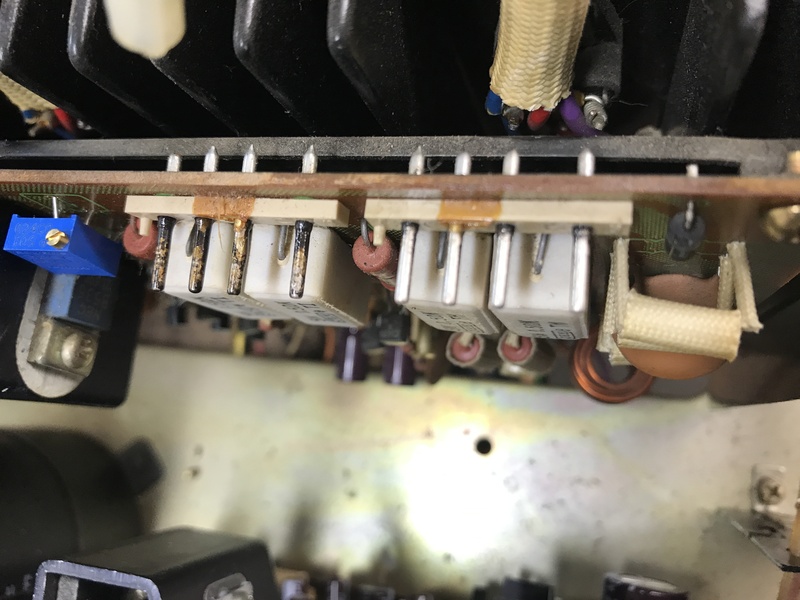 Make sure you get orientation correct, otherwise you’ll blow fuses like crazy… best case scenario. Almost done with the unit. The original lamps all worked. The customer said not to worry about the LED conversion to save some cost. The dial lamps take seconds to replace, however the indicators are a bit more tedious to replace. The dial lamps were a bit dull so we replaced those as it takes no time to do, and the parts aren’t too bad. 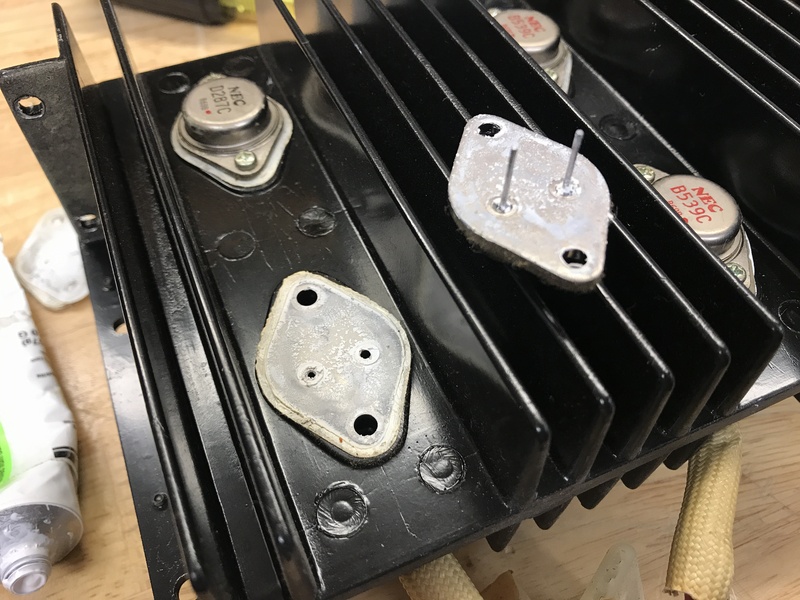 We get our lamps made for common voltages and connections. These are 8v omni-radial LEDs in a soft white color. They give the same type glow as the original lamps did. They require no modification to install in the Pioneer dials. That’s it. Electronically, the unit is done. The controls were cleaned board by board as the recap was done. 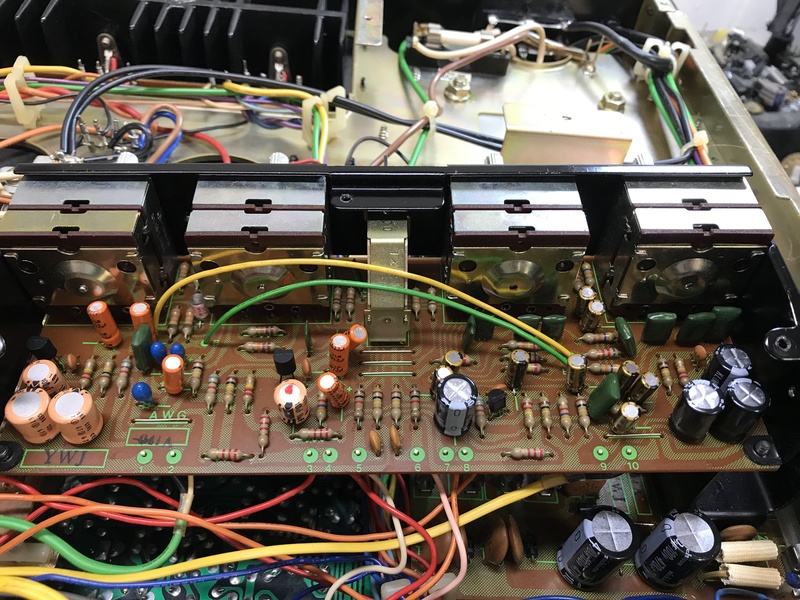 After the unit was done with the recap and restoration, it was dim-bulb tested to make sure everything was ok. After the unit proves to be working, we test for DC offset and check bias. If those measurements prove good, we connect speakers and test all the inputs for signal and make sure there is no early clipping. After about 10-15 minutes, we re-check bias and DC offset. The unit will then be played for a few days to make sure no problems arise before we send the unit home. As we put back together the case, faceplate, and knobs, they get cleaned. We found a nice cleaner at the dollar store that works amazingly well. Lucky us! 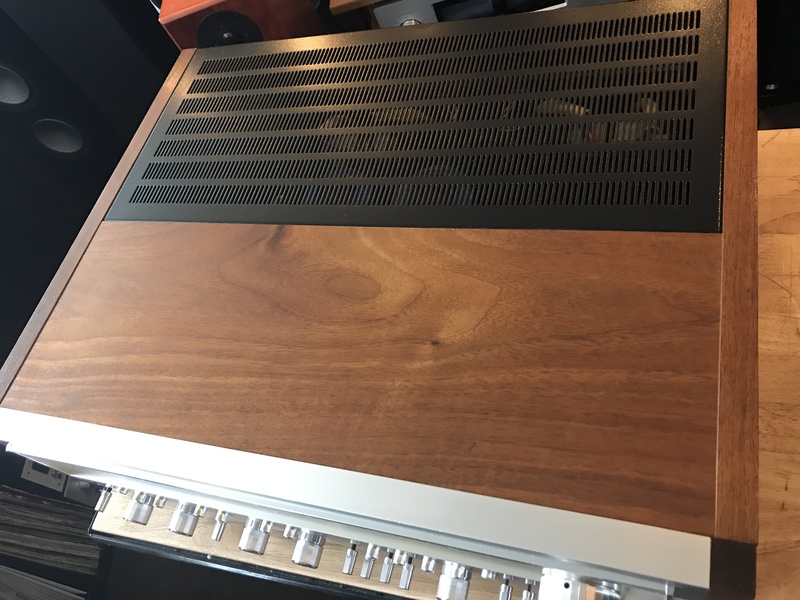 The case on these units has a great veneer on them. They get dry and dull if you don’t maintain care for them. We put a few coats of Howard’s Restore-A-Finish to bring out the grain and fill in any small imperfections in the veneer. Then, we apply a few coats of Feed N’ Wax. These cases, if in good condition, end up looking very very good with little work. 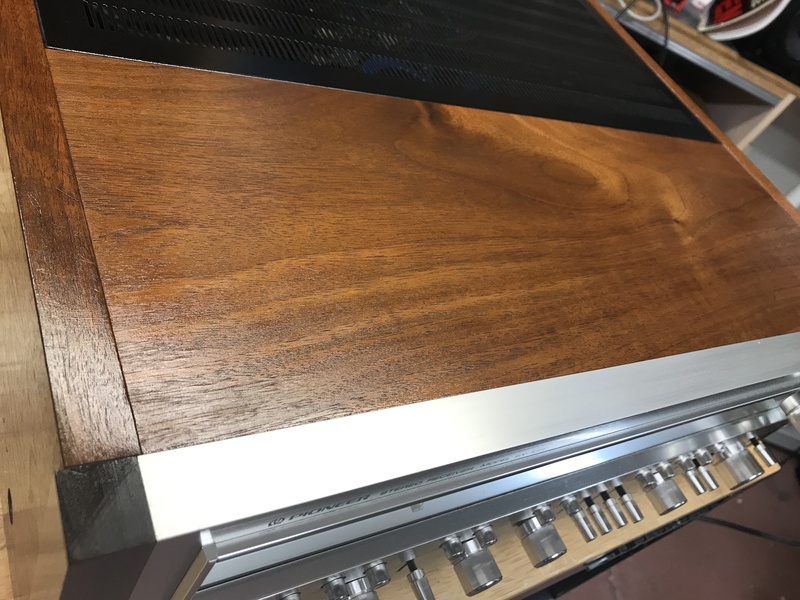 Below is a few more pictures of the case before and after, and of the unit all complete. This will run a few more days and then the owner can take it home and enjoy it as much as we do. 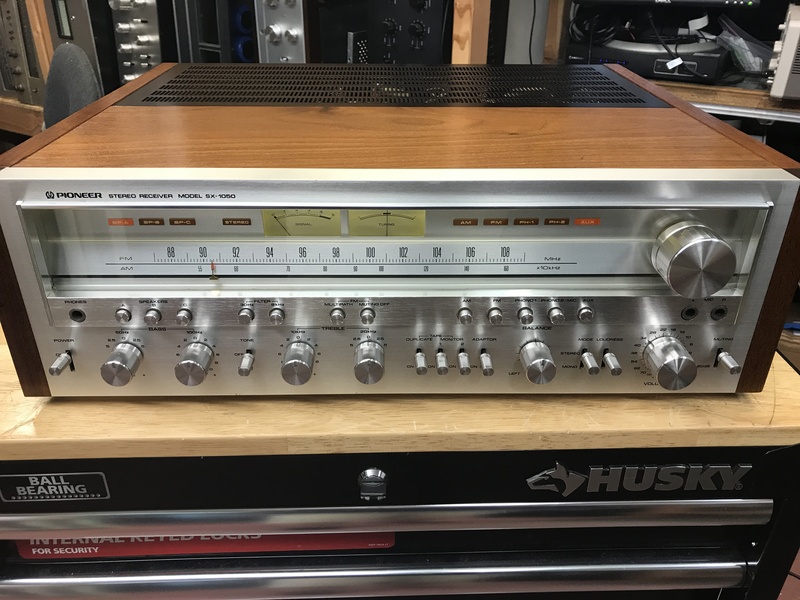 It looks incredible, and sounds better than just about any other vintage solid- state receiver… I think. After the case was restored! The Restore-A-Finish and Feed N’ Wax give the veneer an almost 3-D look. Playing and burning in after restoration.